The junior linebacker at the Division II school in North Carolina had surgery Oct. 13, 2017, to repair his lateral meniscus and missed most of last season. Due to the loss of most of his lateral meniscus and arthritic damage, his doctor recommended he hang up his cleats. After extensive rehabilitation, in May, Gilmore got a second opinion and the green light to return with no restrictions. He has returned to the field with a vengeance, earning second team All-South Atlantic Conference honors while leading Wingate to an 8-3 regular-season record and an NCAA playoff berth. “From the moment he sustained his injury, Elijah has been very determined to return to the field. His mental fortitude is what allowed him to overcome the days of doubt and rigors of rehabilitation,” said Wingate defensive coordinator Rashaan Jordan. Gilmore is fourth on the Bulldogs with 64 tackles and has added seven TFL and four QB sacks. In this past week’s playoff win over West Georgia, he led the Bulldogs with 10 tackles and a sack. 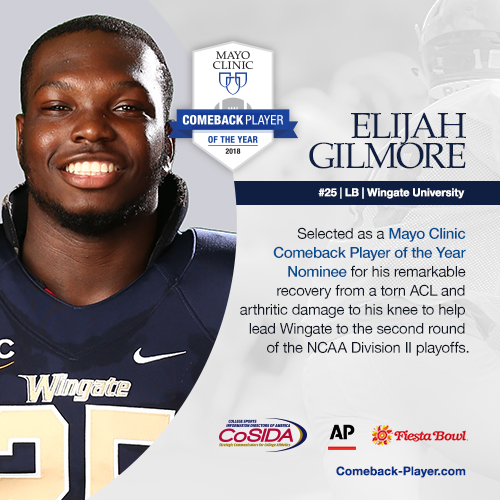 The Mayo Clinic Comeback Player of the Year Award will be presented at the end of the season. Mayo Clinic, the premier sponsor, will donate $5,000 to the general scholarship funds for the three winners and $2,500 in the name of six other worthy finalists. In addition, the three honorees will be recognized during a special ceremony during the 2019 Fiesta Bowl. Honorees and winners are selected by a panel of writers, editors and sports information directors from CoSIDA, AP and Touchdown Illustrated, and representatives of the Fiesta Bowl. Chad Pennington, the only player twice named professional football’s comeback player of the year award winner (2006, 2008), will serve as the Mayo Clinic Comeback Player of the Year Award ambassador. Pennington played his college football at Marshall University and was selected in the first round of the 2000 NFL Draft by the New York Jets.